Meet Michael Lindermann, former Catholic priest. He spent much of his life in the church in England before "abandoning the lunacy," as he puts it, at age 35. He is now 40 years old, and moving to a town in a whole new area. What adventures await him here in Moonlight Bay? Michael is a good man, brave and charismatic, with an artistic flair centered around the theatrical stage. He's a hopeless romantic, and also quite gay. He enjoys classical music above all other types, loves a good tri-tip steak, and his favorite color is aquamarine. It's high time Michael starts thinking about romancing a kind and gentle soul, but before he can even purchase a suitable home, trouble is afoot! Purely by accident, Michael discovers a local plot involving a super-virus. While he only has bits of information, those behind the conspiracy threaten him via an untraceable cell phone call. If he makes certain moves to properly localize himself in the area, they will seek out his loved ones and do them great harm. Thus, he cannot own or rent a house, apartment, or even a room. He also must not buy a car. While Michael's father died two years ago, the former priest does indeed have friends he wishes to keep safe, especially his best friend Jack who lives elsewhere with young son Aiden. 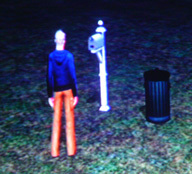 So for Michael to keep his friends safe but also try and unravel the mystery of the super-virus, he finds a vacant plot of land that strangely enough has a mailbox and a trash can. He steadies himself for a life on the streets, glad at least that he has a decent amount of cash in the bank. Why don't we: Get a job? Former Catholic priest: British-born Michael is a staple original character for me from roleplay and writing, based on several Paul Bettany characters as well as the actor himself. 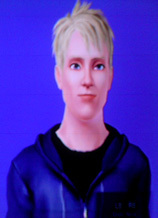 I also have him as a 1/3 scale ball-jointed doll. Michael is an atheist and I created him long before the movie Legion was announced. It was so very surreal to see Paul Bettany playing Michael the archangel, and awesome for him to answer to that name. Most of the backstory for this homeless game is purely made up, as I needed a reason why Michael would be homeless and wasn't content with "he just is." Return to story. Michael's empty lot: I started the game with the house across the street from Pity Committee Community Playground. I then sledgehammered the entire thing and kept the money as the funds Michael would have used to move into a home if he had the choice. The lot is literally just grass, plus the mailbox and trash can which can't be deleted. The amusing part of having a completely empty lot? No bills in the mail, ever! Also, it should be noted that at this point in the story, I'm playing the game with aging turned off. Return to story.